Last week officials with the Canadian Border Services Agency (CBSA) ordered the boy deported. A 16-year-old Syrian boy who arrived at the Canadian border at Fort Erie, Ont., claiming refugee status last month was taken into custody and placed in isolation for three weeks in a Toronto detention centre. Last week officials with the Canadian Border Services Agency (CBSA) ordered the boy deported. By law, Canada no longer accepts refugees who come through the United States. But his lawyers say the boy is an unaccompanied minor and should be allowed into Canada to claim refugee status. "It is a terrifying prospect for him to go to the United States where he doesn't know what will happen to him." Aviva Basman of the Refugee Law Office in Toronto called it "outrageous" that Mohammed (we are using a pseudonym for safety reasons) was not only denied entry but was detained in isolation for three weeks at an Immigration holding centre in Rexdale. "Everyone who's involved in Mohammed's case has found the way CBSA treated him quite shocking," she told CBC News. "We're talking about a 16-year-old Syrian boy who's just trying to find protection." Mohammed has since been released from the centre and is being housed at Romero House, a shelter for refugees. He met with a CBC reporter and, in broken English, described his time in isolation. "I don't sleep good, I dream," he said. "Three weeks in detention, I'm feeling sad and I cry all the time. The room, the iron on the windows, I'm afraid." He said he was allowed outside a half hour each day. The rest of his time he said watched television or tried to sleep. "I want to stay here. I want to go to school. I no have anyone in the United States," he said. "Canada government bring many people from Syria, Jordan and Lebanon, Turkey but I am coming here and they don't accept me." Hannah Deloughery, an intern at Romero House, has been working with Mohammed since he arrived there. "He's very scared and confused and doesn't really understand why this happened," said Deloughery. "He's alone in Canada and needs our protection." Mohammed's family fled Syria for Egypt after the war began. But when Mohammed turned 16, his residency permit in Egypt expired. He faced being sent back to Syria and being conscripted into the military. Fearing that, his parents flew with him to the United States and then arranged to get him to the Canadian border. They believed Canada's openness to accept Syrian refugees meant he would be safe here, while they flew back to Egypt. "They had heard the Prime Minister say that Syrians were welcome in Canada and would be safe and protected here and they felt this was the best place for Mohammed to come," Deloughery said, adding that the family has cousins in Mississauga. 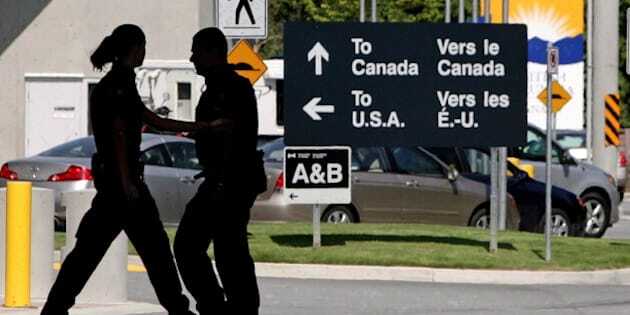 But officials with the Canadian Border Services Agency denied the boy entry. They took him into custody, even though he had arrived on his own and would have been considered an "unaccompanied minor" and therefore, admissible. Last week he was ordered deported to the U.S.; from there he could be sent back to Syria via Egypt. "It is a terrifying prospect for him to go to the United States where he doesn't know what will happen to him, he doesn't know if he will be able to stay in the United States of if he will be deported to Egypt and then face deportation to Syria," Basman said. "He doesn't have any family or friends in the U.S. where here he has cousins and family friends and a developing community of support." "I want to stay here. I want to go to school. I no have anyone in the United States." Mohammed was scheduled to be deported on Feb. 18. But on Monday, border officials delayed that for a week. His lawyers are now appealing to the Minister of Immigration and Refugees to allow him to stay and have his case heard by a refugee determination board. The minister, John McCallum, has yet to respond. "We're asking the Minister to intervene," Basman said. "This boy's been through a lot and we really hope that ultimately, this will resolve well for him and that Canada will do the right thing here." Meanwhile, Mohammed remains at Romero House. He's passing his time helping other recently-arrived refugees from Syria settle into Canada. He says he hopes to remain in Canada, finish high school and study to be an engineer.